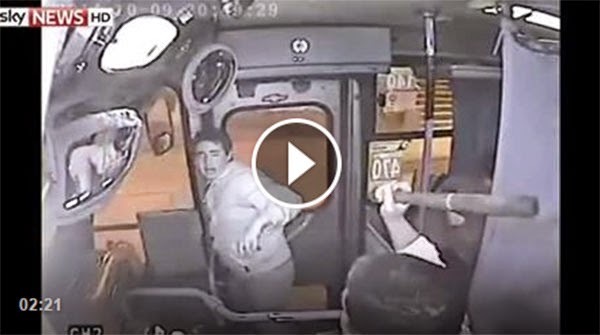 A video showing a bag snatcher being trapped inside a bus and then hit with a bat by the driver has gone viral online this week. According to skyNEWS, the incident happened in Concepcion City in Chile last October 9. In the video, a man initially tried to grab the bag of a female passenger sitting in the front seat like he was joking. In his second attempt, the commuter didn't give up and even held her bag as firm as she could. The driver made a quick decision to roll the bus and close the door to prevent the snatcher from fleeing while a second man, believed to be a lookout, tried to open the door from outside. The brave driver then took his bat and started hitting the trapped snatcher until they arrived in a location where there's traffic police. The crying snatcher was arrested. Everything was caught on the built-in CCTv camera of the bus, the footage of which was apparently seen live in the operations center of the bus company.